It seems like every day there’s some new female superhero news dominating our lady-crazy media landscape, drowning out the poor old supermen of the TV and movie worlds. Supergirl. Jessica Jones. Wonder Woman. Captain Marvel. Uh, Ghostbusters? (Sorry, we seem to have already run out of female-led superhero movies and shows.) Finally, though, there’s some superhero news—besides Justice League, Luke Cage, Doctor Strange, Captain America, Iron Man, Black Panther, Ant-Man, Guardians Of The Galaxy, Iron Fist, The Avengers, Aquaman, Thor 3, and The Flash—for the fellas to dig into, with Variety showing off the first pictures of Teen Wolf’s Taylor Hoechlin in costume as Superman on the recent CW transplant Supergirl. Hoechlin will play the Finally-a-Man-of-Steel on the second season premiere of the show, currently set for October 10. 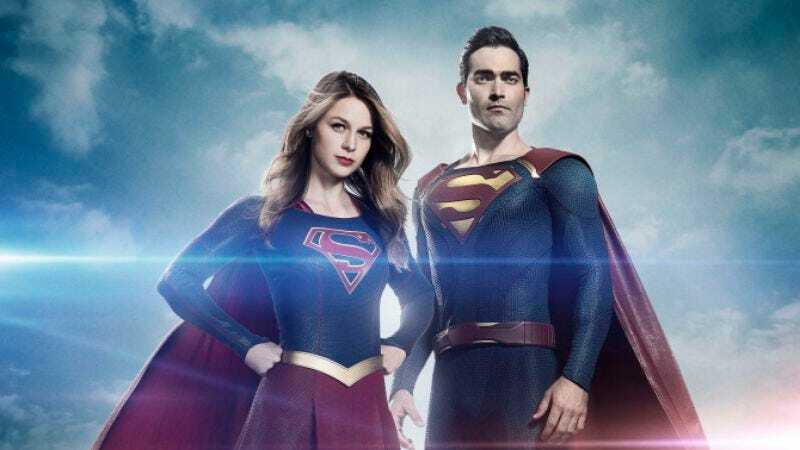 According to the show’s Comic-Con panel last weekend, the meeting between the two Kryptonian cousins won’t go entirely smoothly, with executive producer Sarah Schechter telling attendees, “I think that Clark has a very different experience of what it means to have superpowers on Earth.” (But hey, at least Hoechlin’s Superman and Melissa Benoist’s Supergirl agreed to coordinate on their snazzy uniforms, picking identical colors and types of weird superhero costume mesh for their duds.) We now return you to your regular news programming, courtesy of the vast, all-powerful female superhero conspiracy.